My wonderful friend and reading triplet, Jacki, sent me this book at the beginning of the year and, I do not exaggerate, it changed my life. I read it right around the same time I discovered 52 Weeks to An Organized Home, and it fit with that challenge and then took it a step further. 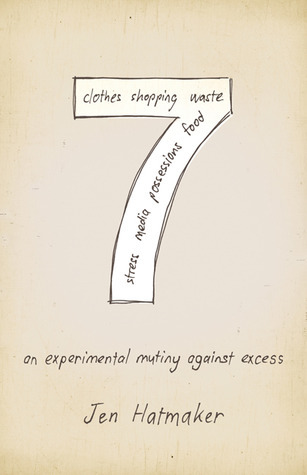 The premise is that the author, Jen Hatmaker, was convicted about the excess in her family in these seven areas - clothes, shopping, waste, food, possessions, media, and stress. So she took seven months and attacked one area of excess every month, making radical changes in the way she lived her day to day life. And the results are just amazing. The book's is formatted to reflect the structure of blog posts, following the course of each month as the author implements changes and realizes the impact of her choices. The format completely fits the author's tone, which is informal and conversational. One thing that stood out to me is the authors humility. When you're writing a book that challenge so many of our natural inclinations and much of what we've been taught and conditioned to believe, it's so important to come across in an approachable manner. Had Hatmaker started listing the evils of contemporary culture, she would have lost her audience immediately. Instead, she uses her own life and her own struggles to illustrate societal issues in a way that doesn't seem preachy or confrontational. I was immediately challenged by the book. 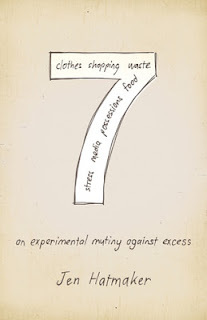 When the author begins to count the clothes in her closet, I knew I had a problem as well. Each section of the book pushed further and further against my complacency in terms of what I own and the injustice of my wealth when compared to the way the majority of the world lives. The book is compulsively readable and I finished it quickly, but I do plan on doing a reread before the year is out. It truly revolutionized the way I think about "stuff". I got rid of four garbage bags full of clothes. On the recommendation from the book, instead of dropping them off at Goodwill, I gave them to a friend at work who donates clothing overseas. I've started questioning my spending. Before I buy something from the dollar section at Target, I ask myself how I'll use it, when I'll use it, and if it's a purchase that will advance the things that I value for myself and my family. I've looking into local farming options. I've started going to the Farmer's Market for produce and trying to buy with the environment in mind. You must read this book. I can't recommend it highly enough. You should be aware up front that Hatmaker is a Christian and her changes are motivated by her interpretation of what it means to follow Christ in these areas. She really focuses on the social importance of the gospel and how Christians can change areas of excess to reflect Christ to those we interact with. Obviously, this part of the book was very appealing to me. Again, I can't recommend it highly enough or thank Jacki enough for sending a copy my way! I have been dying to read your review ever since you first mentioned this book. I hope I can get my hands on it soon. I am constantly feeling like I have too much "stuff" but I don't even know where to begin when it comes to thinning it out. I failed at the 52 week challenge last year, but this seems more...purposeful, I think.